Jim Lehane on The Geology P.A.G.E. is asking the question "What geological concept or idea did you hear about that you had no notion of before (and likely surprised you in some way)." Well I will admit that there is a problem that I come across only in geologically recent times and still puzzles me. Most beautiful is what we do not comprehend." Can a pile of rubble have e name and be studied? Apparently yes - a Talus (term used in North America, borrowed from the architecture of fortresses)) or Scree (English) can be defined as landform composed of rock debris accumulated by mass-wasting processes - or as pile of rubble. But despite this simple explanation, their humble origin, being often neglected during lectures or considered only disturbing in mapping the bedrock lithology, talus slopes are complex geomorphologic features still holding many secrets (not only to me). 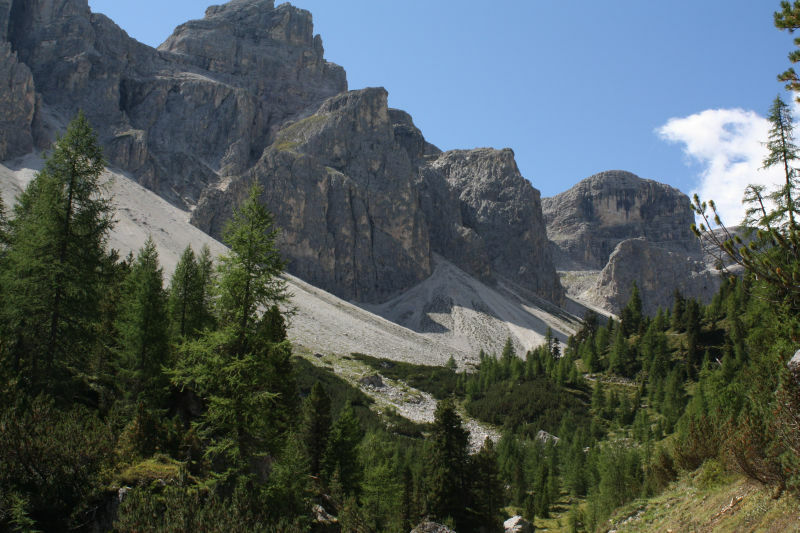 These landforms occur in a wide range of environments, but most predominantly where the climate enforces on steep rock walls or cliffs physical weathering and mass-wasting. If the supplied rubble is enough, the subsequent weathering and removal rate low, a characteristic, thick cone or slope of rock debris can form. 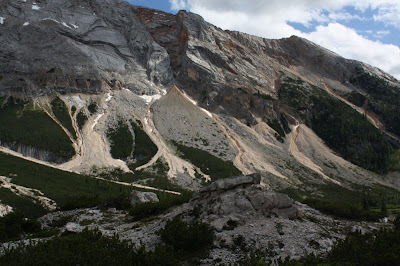 Rockfall is one important factor to form a talus; however depending on the catchment are other mass-wasting processes can act on the morphology of the talus, large rock avalanches can occur, debris flows, avalanches and dry grain flows also transport material on the developing slope. These various processes can alter the form, the composition and the grain size found on the talus - so it is not easy (if possible) to foresee the inner matrix by only observing the surface. In most cases the coarse openwork surface texture is merely a veneer. Talus deposits consist of debris with a wide range of sizes, like a sieve, fine material accumulates in the voids in the deeper parts of the talus. Interestingly for me such a similar phenomenon has been observed also in rock glaciers and landslide deposits - I therefore experienced that is it tricky to map such features as simple aquifers. Fig.1 and 2. More regular Talus slope / Talus aprons in the upper photo and cataclinal (bedding and slope coincide) slope with various Talus cones and modification by debris flows in the Dolomites. Fig.3. Example of talus deposits reworked by debris flows (with the typical levees on the sides of the channel) in the Central Alps, area characterized by schists and metasediments. Physical and chemical erosion in such rocks is generally stronger, talus deposits tend therefore to be fine grained and covered by soil and vegetation. Talus deposits are mainly results of mass-wasting processes, if fluvial ("wet") processes play also or a dominant role the term Talus fans is used. The overall morphology of a talus slope depends also on the form of the cliffs supplying the debris. Straight plain cliffs will produce a straight sheet talus (Talus slope / Talus aprons), cliffs with channels or gorges will canalize the debris and Talus cones will form. 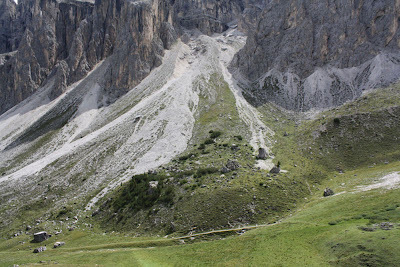 It is mostly that both forms will occur in narrow spatial and temporal succession, a regular cliff will develop channels with ongoing erosion and faults can disrupt the regular conformation of a cliff. Many talus slope profiles show at least segments with an inclination of 33-35°, a common value for rubble, however considering the entire slope there are significant variations. Mapped talus slopes show that the upper part has an angle of 32-37°, up to 40°, the medial part approaches the value of 33°, the lower part displays low angles and a basal concavity. The segmentation of the profile is in accordance to a change in the facies. This shape is explained in part by various processes acting along the profile, in the upper part transport and deposition of debris, in the lower part mainly deposition. There is also a change in the grain size caused by "fall sorting": large boulders with their large momentum and energy proceed until the toe of the slope, also the roughness increases downhill, where older large boulders can stop the run of the new arriving boulder. The degree of sorting depends on the slope length, cliff height and the size and shape of dominant particles. This is an important effect of talus slope to be considered when defying a zone of danger or planning mitigation efforts. Talus slopes in periglacial environments are again peculiar in some characteristics. A snow patch on the base of the slope and subsequent sliding of debris above this surface can produce a distinct ridge, termed protalus rampart or nivation ridge. Covering of snow by such debris is thought to produce an ice-rock mixture that can begin to creep following gravitational pull, a protalus lobe (often unfortunately also referred as protalus rampart), considered by me as one possible variation of rock glaciers. When the ice melts out, unlike glaciers these lobes can not recede and became fossilised. Fig.4. Complex talus deposits in the Antersac-Valley, Dolomites. The basal vegetation covered protalus rampart is a relict of a colder climate in a periglacial environment, probably during the aftermath of the last glacial period (18.000-12.000 years ago). Rockfall from the steep cliffs and canalized by a gully provide further debris, forming a talus cone, however the vegetation cover shows that the activity on it today is low. Most recent modifications are erosion of the upper part and secondary mobilization of material by various debris flows. The coarse debris forming the talus can become preserved, and there is ongoing research to use these deposits to interfere the climate of the past. 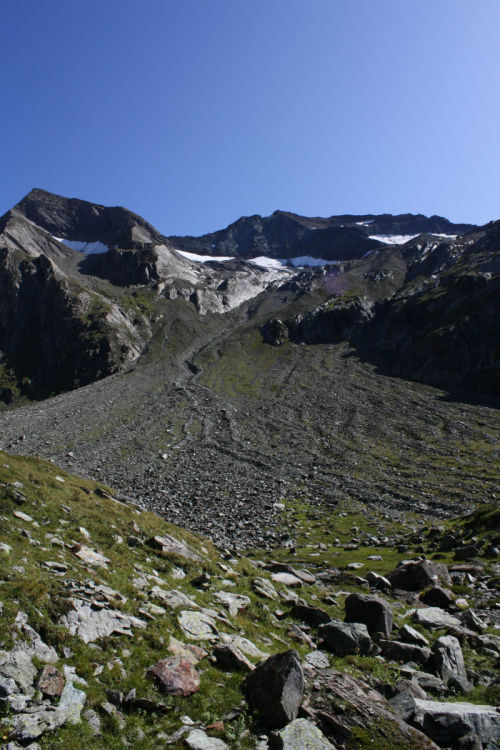 The presence of a Talus as such is not specific related to climate or environment, however the processes (avalanches, debris flows, grain flows) forming or modifying the Talus are depending on the climate. Another possibility, despite recognizing the characteristic forms of ice-rock bearing talus slopes, is to try to calculate the accumulation of debris, and so the rate of weathering of the cliff. Assuming that a cold and wet climate increases debris production the ages of talus deposits can provide ages of such climatic phases. In talus slopes composed of carbonate rocks it is also possible to date directly the cement or the matrix formed between large boulders. Measuring the oxygen or carbon isotopes it is possible to recover direct climatic values. These are only some considerations of many. Talus slopes are wonderful complex landforms, and being common in the region I work, they still continue to fascinate and intrigue me.